Every Monday some of the students get awards for reading every night of the week but not on the weekends. They get different ones for how many nights they have read. 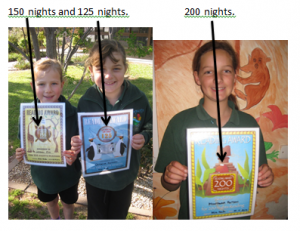 The first award they get is from 25 nights to 200 nights which is the last one you get and others if they read every night including the holidays.